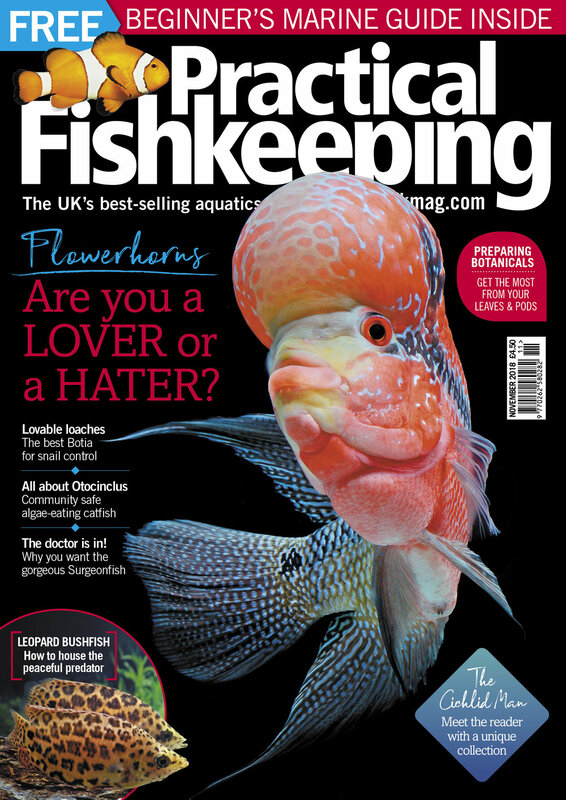 This month’s issue comes complete with a FREE 16-page Marine Beginner’s Guide, on top of the high-calibre fishkeeping content you’ve come to expect from us here at PFK. In this bulging issue we have everything from Moray eels to Botia loaches, tiny catfish, big-mouthed predators plus a wealth of cichlids and breeding tips to try at home. Flowerhorns! Our cover feature this month is absolute fishkeeping Marmite. Are you a lover or a hater of the hybrid that’s dividing fishkeeping communities? Nathan Hill investigates. Ichthyologist Tim Smith looks at a Leopard that won’t change its spots – the Leopard bushfish! Meet the fish with the high-speed bite and stunning markings. Tristan Lougher talks Tangs – those graceful, elegant, matt-coloured herbivores that grace the finest marine set-ups the world over. Steve Baker investigates the loaches of the Botia genus, unveiling a surprisingly friendly, snail-munching bunch that might be better suited to the community than you think. For our reader visit we take a trip to see Max Pedley, a young aquarist with an enviable cichlid collection and an encyclopedic knowledge. Ol’ blue eyes – Lee Nuttall, the UK’s leading cichlid biotope aficionado, gives us an insight into the life, taxonomy and care of Cryptoheros spilurus. World renowned fish breeder John Rundle returns with a magnificent piece on breeding Nannacara taenia, a charming cichlid that’s often overlooked but a real delight to keep. Otocinclus are more than just miniature algae eaters. They’re a catfish curiosity all of their own, with fascinating feeding techniques and heaps of activity. Also in the issue: building a home for Apistogramma, how to prepare botanicals, roadtrip to three great Essex stores, exploring the Pantanal, Fluval’s new LED lights with Bluetooth connectivity, the ethics of fish breeding, all your fishkeeping Q&As resolved, news and more!